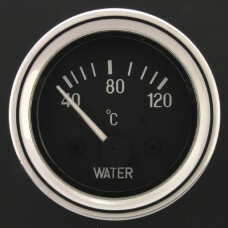 Electrical water temperature gauges indicate engine coolant temperature in degrees Celsius (°C). A matching ETB temperature sensor is required to provide the gauge with the correct input resistance. The gauges are supplied a 'U'-shaped fixing bracket and thumb nuts along with a 12v /2w illumination bulb. Night illumination is classic white.